The Queen City Brass Quintet has had more than 30 years to build a closeness that enables each member of the group to know what the other will do even before he does it. This sixth sense gives the QCB a level of communication other ensembles can only dream about. The nationally renowned group has been featured several times Garrison Keillor's program, A Prairie Home Companion, broadcast live on Public Radio from St. Paul, Minnesota. They have also appeared on Charles Kuralt's television series The History of Cincinnati, and were featured by the Cincinnati Historical Society on a concert celebrating the Cincinnati Sesquicentennial. 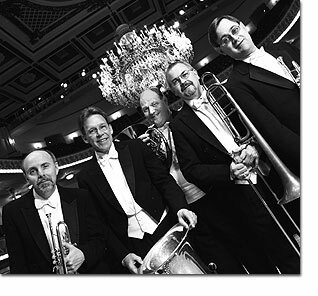 Known for its versatility in performance, the Queen City Brass Quintet has pleased audiences of all ages and backgrounds, performing repertoire from Classical to Ragtime, Dixieland, Big Band, and even German Brass Band music. The Queen City Brass Quintet has performed at festivals and music series as far away as Gifu, Japan, and in Chicago IL, Minneapolis MN, Dayton OH, and throughout much of the Midwest. QCB has been a regular performer with the Taft Museum Chamber Music Series, Cincinnati Symphony Orchestra Area Artist Series, and the University of Cincinnati CCM Artists on Tour. The QCB was Xavier University's first Ensemble in Residence, and was Ensemble in Residence for Cincinnati's first annual Springfest. The Queen City Brass Quintet performs regularly in schools in the greater Cincinnati region. They can fashion a school program that will fit almost any educational need. For more information on educational programs check our education page.